The Domaine of Chamblandes charms at first sight with its privileged environment. Just outside Lausanne, in the city of Pully, time seems to stand still in this residence, cradled by the lake Léman/Geneva and its astonishing view over the Lavaux region. Selection of 2.5 to 6 pieces flats in high standing quality, benefiting from an indoor swimming pool in a secured surrounding. Immediate delivery. A stunning view and direct access to the lake shore. Optional private harbor. A contemporary style conceived harmoniously with its verdant and calm environment. Wish to visit ? Get a brochure ? The Domaine of Chamblandes charms at first sight with its privileged environment. Just outside Lausanne, in the city of Pully, time seems to stand still in this residence, cradled by the lake Geneva and its astonishing view over the Lavaux region. Each apartment enjoys this view, away from the urban bustle yet close to all amenities in proximity of Lausanne city. Four exceptional apartments from 2.5 to 4.5 pieces , between 144 and 209 m2. Seven exceptional apartments from 4.5 to 6 pieces, between 185 and 295 m2. 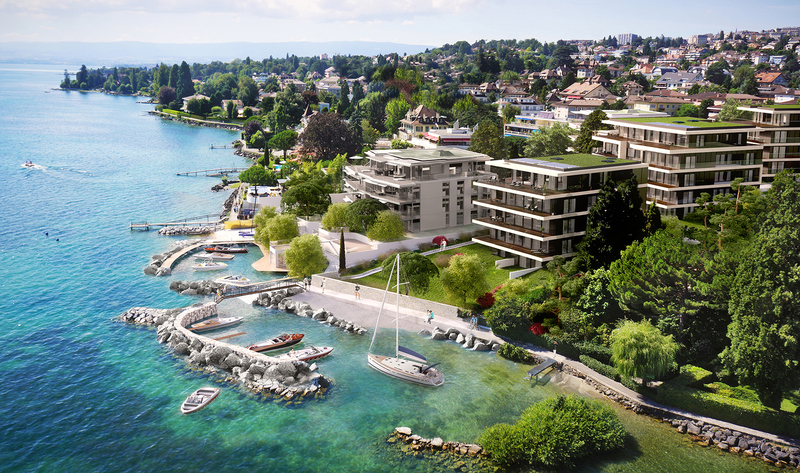 Its location in Pully is ideal for all amenities.